The Aggies play a 17-game home schedule this year, including home events with UNM, UTEP, Colorado State, Cal Irvine and the entire WAC. Season ticket prices start at $50 for upper level seating, which is less than $3 per game. Lower bowl season ticket pricing starts at $150. Led by head coach Marvin Menzies, NM State has won three-straight Western Athletic Conference championships and four of past five. The Aggies have also made three trips in a row to the NCAA tournament. With the reigning WAC Player of the Year Daniel Mullings and a solid returning nucleus from last season, a breakthrough season and a deep run in the NCAA tournament are certainly within reach. Season tickets are available for purchase on Sept. 19 and renewals will be sent out Sept. 15. 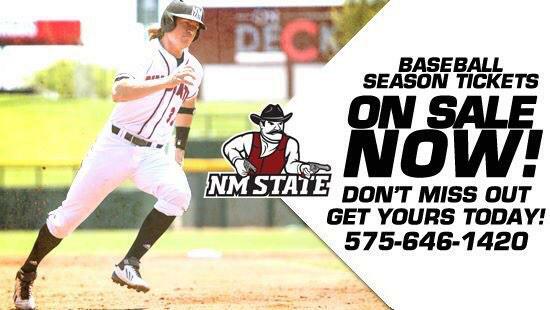 Tickets can be purchased at the Pan American Center ticket office or by calling 575-646-1420.